Frida was born in Narvik, a small town in the very north of Norway. When she was two years old, the family moved to Sweden, where she made her first appearance as a singer on the stage at the age of ten. She had an orchestra of her own for several years and then had a very big success on a popular TV program. After that everything happened at once. She made several records which soon found their way to the top of the hit parades in Sweden. She also got the opportunity to work with several of the most popular artists and actors in Scandinavia and she participated with great success in some international song contests, in Japan and Venezuela other places. During the past few years she has become known as one of Swedens best female singers. Since April 1972 she has been a member of ABBA. Shes dark and tall and, to Benny at least, the Beauty of the group. Shes also Norways gift to Sweden – even though she didnt even stay long enough in Norway to pick up very much of the language. If youve heard about that Scandinavian phenomenon, the Midnight Sun, well, then thats Fridas birthplace. But soon, Frida moved to Eskilstuna also an iron-and-steel town, but southwest of Stockholm, Sweden. At the tender age of two, Frida didnt know the difference. Of the ABBA foursome, Frida may very well be the one with the broadest knowledge of popular music in all its shapes and forms. As a kid, she was forever miming ALL the records she heard on the radio. Not just the hits of day, but also the evergreens of people like George Gershwin, Cole Porter, Richard Rodgers. At age ten, Frida made her first stage appearance. The occasion was an amateur contest – then maybe more than these days, the almost only way for a fledgling talent to get some recognition. And soon after school, Frida was supporting herself nicely, fronting a dance band of her own. – At the time, I was probably more into singers like Ella Fitzgerald and Peggy Lee, Frida remembers. – Of course I was aware of the Beatles and the Beach Boys, groups like that. But they were groups, and I had solo ambitions; Benny was very important when it came to molding my musical conceptions along more contemporary lines. By the time Frida met Benny, she had moved to Stockholm. She was still "a promising vocalist: But her records so far had been aiming towards a middle-of-the-road-format, and by her own admission, she "wasnt very pushy, career-wise..."
Two things changed the course of her career. First, there was a TV appearance on a then very popular Swedish talk show. Frida was called upon to sing a few songs; she had done it before on the tube, but this time, national Swedish newspapers suddenly proclaimed her "Breakthrough of the Year". And in the aftermath of all excitement that this "break" caused – along came Benny. The year was 1970. Frida had been running into Benny off and on in Stockholm showbusiness circles. But it wasnt until a joint cabaret engagement in Gothenburg, that "something happened". Benny, already an established performer and seasoned songwriter, started using his own ladys talents for back up vocal work in Swedish recording studios. Pretty soon, Björn was bringing Agnetha around to the same sessions. – It got to the point where the girls were doing more up-front singing than we were ourselves. So we said: why dont we make a regular group of it all? Frida has done a more than a fair amount of travelling since then. She has appeared on dozens of major television shows all over the world. Today, almost three years later, ABBA surely keeps the world record for longevity; as Eurovision Song Contests go, annual winners seldom survive their first hit. To Frida, the kind of unparallelled success she is experiencing with ABBA is not all a bed of roses. The never-ending string of TV appearances both in Europe and in the U.S. that goes with international record promotion can sometimes be somewhat of a pain. – Thats why we are looking forward to this tour with so much anticipation. You know, on Television they call upon you to mime to a pre-recorded tape containing your latest hits. It took the newly established group a couple of attempts before it all came together – but from then on you all know the story. ABBA from Sweden came to Brighton for the Eurovision Song Contest of 1974. They wiped out all competition with their gusty performance of "Waterloo; penned by Björn, Benny and ABBA manager Stig Anderson. She’s tall, slim and, most decidedly, a smart dresser. She’s very much into clothes, but prefers books before shopping. Occasionally, when her duties within the ABBA group takes her down to Italy to find just the right materials for suitably flashy stage outfits, she just might forget her mission and almost submerge herself in anything from Leon Uris to Heinrich Böll. That’s Frida – Norway’s gift to Sweden. Or to the world of pop music, for that matter. As things have developed over the past few years, ABBA seems to spend more time outside Sweden than in. 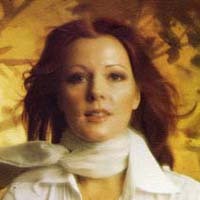 Frida – or Anni-Frid Lyngstad, according to her Swedish passport – saw the light of day in post-war Norway. More specifically, she stems from Narvik, a tiny iron export town way up in the North, well above Midnight Sun latitudes. Not that Frida stayed long enough to remember much of that very Scandinavian phenomenon. Soon, she moved to Eskilstuna, also an iron-and-steel town, but south-west of Stockholm, Sweden. At the tender age of two, Frida didn’t know the difference. Of the four ABBA members, Frida may well be the one with the broadest knowledge of popular music in all its shapes and forms. As a kid she was forever miming to every record played on the radio. At 10, she made her first stage appearance in a local amateur contest. In her teens, Frida was supporting herself nicely, fronting a dance band of her own. Not that the band was exactly successful. But Frida was able to fulfill her one and only dream: she was singing. Today, that remains her biggest ambition. – Live singing – boy, that’s such a different kick. Over the years, we’ve spent so much time in the studios that a live tour like this one is s breath of fresh air. She’s eminently able to do just that. Her hair a deep copper hue, he body in perfect control, executing that loose ABBA choreography in tandem with Agnetha, hers is a commanding stage presence. These days, Frida knows that hard work is all-important. When at home in Stockholm, she takes daily ballet lessons. Not for any show-off purposes, but “it feels sooo good to be in physical shape”. And the ABBA stage show benefits from it. Some years ago, claims Frida, she was more a typical “vocalist”. Motionless. By the time she moved to Stockholm and met Benny, she was “promising” – but still a “vocalist”. – At the time, I was probably most of all into singers like Ella Fitzgerald and Peggy Lee, she remembers. – Benny was responsible for molding my musical taste towards more “today” sounds. ABBA was still an unknown entity. Frida worked in cabaret, television, even touring with occasional summer packages. She gained self-assurance, her voice maturing with natural ease. She made records on her own. She even participated in some international song contests, in Japan, Venezuela. Places where she was a complete stranger then, but where her good looks and mesmerizing vocal quality now are instantly recognized by millions of ABBA fans. – Naturally, we knew that the group had something special going for it, what with Benny’s and Bjorn’s extraordinary talents getting those songs togehter. – But still – it was just unbelievable! There I was – former band vocalist from Eskistuna, Sweden, getting mobbed, almost, by the BBC and by reporters from all the major newspapers of Europe… whew! Since then, of course, the ABBA outfit has proven their extraordinary staying power, coming up with a couple of dozen songs just as strong and memorable as that winning Brighton theme, “Waterloo”. As Eurovision Song Contest victors go, that’s quite a feat in itself. To Frida, the kind of almost unparallelled success she is experiencing now with cohorts Bjorn and Agnetha and husband Benny is not all a song-and-dance existence. Driving her cherry red Maserati in Stockholm, she causes traffic jams when fans move in to get a closer look. In the summertime, she and Benny and their kids from earlier marriages do not always succeed in finding a little privacy on their gorgeous island retreat in the Stockholm archipelago. Last Winter, Frida especially enjoyed breaking loose from the heavy ABBA schedule, accepting a minor part, “small, but interesting”, as “the other woman” in a Swedish movie production dealing with “the eternal triangle”. The film was shot in Seville, Spain. – Any artist/singer has to re-load her creative batteries now and then. Now, I’m really looking forward to our first real tour of the US with renewed anticipation. It’s another exciting dream come true! In February 1982 Frida started recording her first English language solo album ’Something’s Going On’, produced by Phil Collins. This was followed by the 1984 album ’Shine’, produced by Steve Lillywhite. But then Frida withdrew from the public for a number of years. In the early 1990s Frida devoted most of her time to environmental issues, but in 1996 she made a comeback with the Swedish language album ’Djupa andetag’ (”Deep Breaths”). This remains Frida’s latest solo album so far. Today she leads a fairly low-key life, devoting herself to environmental issues and charity work. Recently, however, she has guested on records by other artists. In 2002 Frida duetted with Filippa Giordano on La Barcarolle, a recording only released in Japan. The following year she appeared on a CD single released by singer Dan Daniell for charity purposes. Frida’s most recent recording was her lead vocal performance of the song ‘The Sun Will Shine Again’, included on former Deep Purple keyboard player Jon Lord’s album Beyond The Notes (released in 2004).